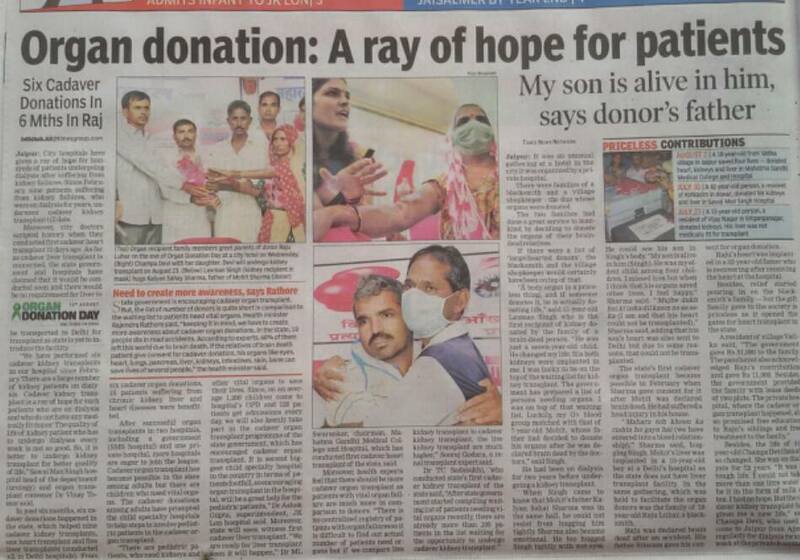 Friday was a big day for Rajasthan in the field of organ transplant. MGH doctors performed transplant of not only liver and kidney but also pancreas transplant was conducted for the first time. 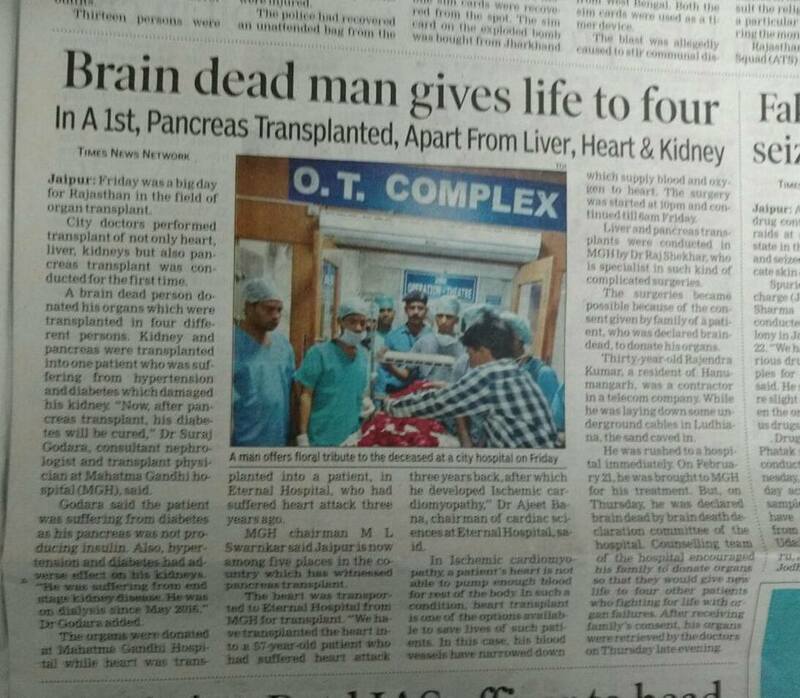 A brain dead person donated his organs which were transplanted in four different persons. Kidney and pancreas were transplanted into one patient who was suffering from hypertension and diabetes which damaged his kidney. Twenty two-year-old Satyabhan was brought to Mahatma Gandhi Hospital on November 4 after he was injured in a road accident in Bharatpur. Though doctors treated his head injury, he was declared brain dead on November 6 by the hospital's committee. 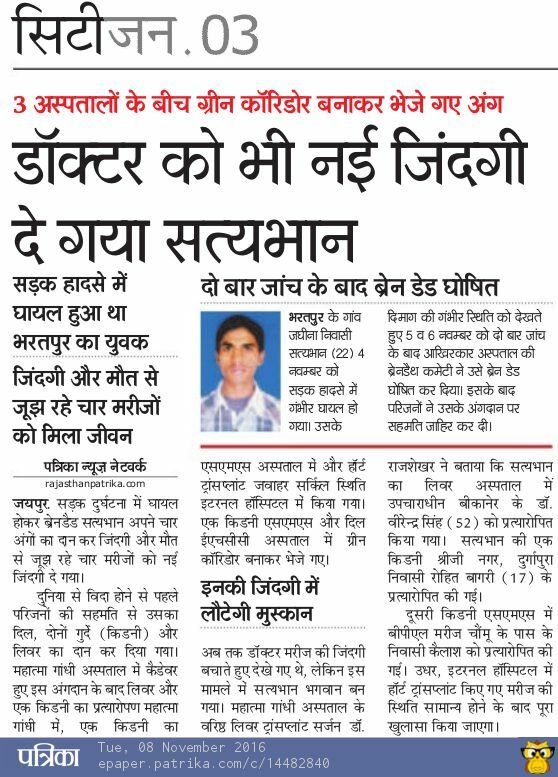 Satyabhan's father gave his consent to donate his son's organs to save the lives of other patients, suffering from organ failure. His liver and kidney were transplanted at mahatma Gandhi hospital and heart was harvested and transported to Eternal Hospital with the help of traffic police. Taking a brave decision, family of a 33-year-old man, who was declared brain dead while undergoing treatment in the Sawai Man Singh (SMS) hospital on Friday, donated his organs -kidneys, liver and cornea. The doctors harvested his organs and transplanted them to save three lives. The liver was transported to Mahatma Gandhi hospital and successfully transplanted by DR. Giriraj Bora and his team. Mahatama Gandhi Medical College is the only private college in the Rajasthan who got the permission to start Superspeciality courses(DM,MCH) from the year 2016-17 in seven departments including Neurology, Nephrology,Urology, PLastic surgery, Neurosurgery, CTVS, Gasteroenterology. A 40-year-old brain dead woman gave a new lease of life to four patients suffering from heart, kidney and liver diseases. Her heart, harvested at Mahatma Gandhi Hospital in city, was transported to All India Institute of Medical Sciences (AIIMS) in Delhi. 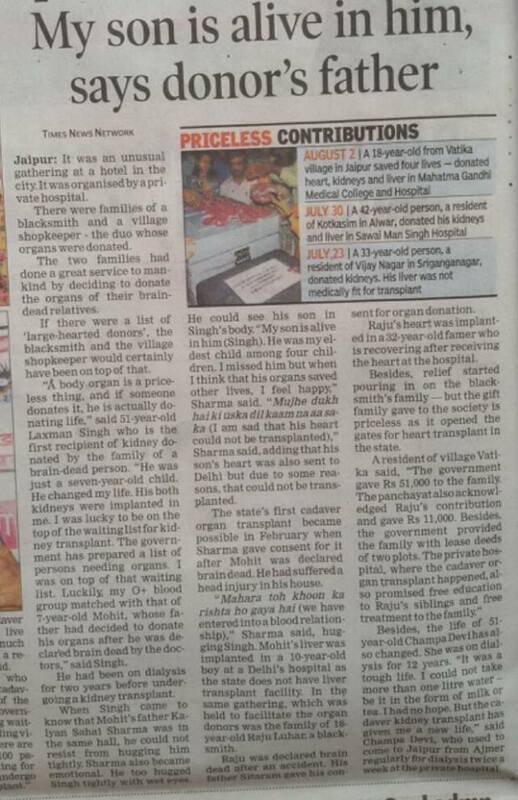 While her other organs were transplanted to patients in Jaipur on Friday . State’s first ‘incompatible’ kidney transplant performed on 21-yr-old at Mahatma Gandhi Hospital. Mahatma Gandhi Medical College and Hospital transplanted a kidney of 50-yearold Kailash Singh (B+ donor) to his son Ranu Kumar (O+ acceptor),ABO incompatible transplant is a method by which an organ can be transplanted to a patient even if his blood group does not match with the donor. It is the best option for a patient who has no compatible donors in the family and the cadaver waiting list is long. 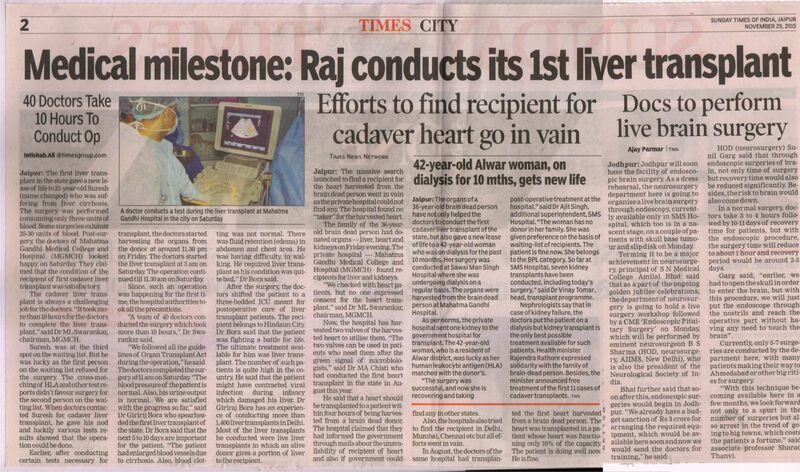 Second Sucessful Liver Transplant in Rajasthan at MGH was performed on 6/12/15. 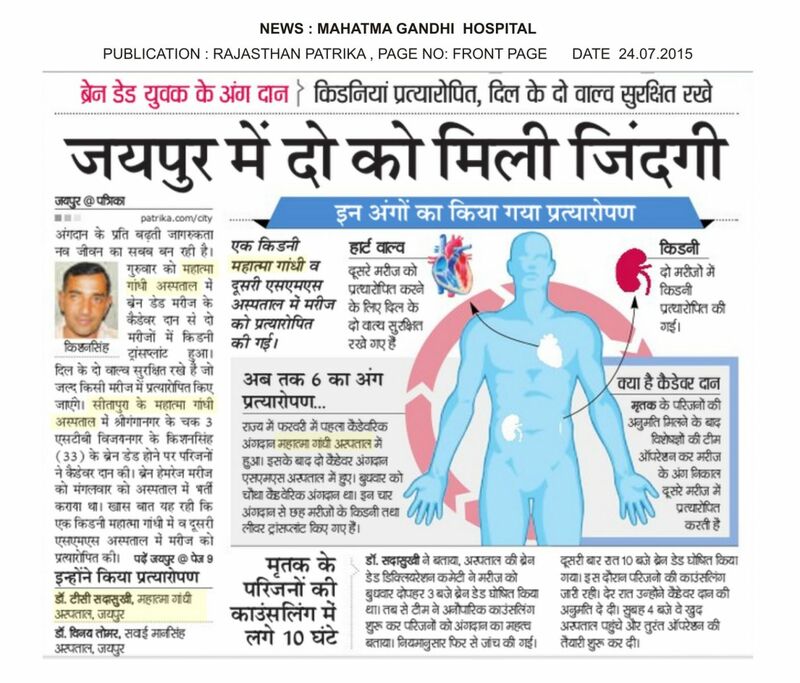 Another successful liver transplant was conducted in Jaipur eight days after the state's first-ever liver transplant was conducted at Mahatma Gandhi Hospital.The donor was a 55-year-old brain dead patient whose relatives agreed to donate his organs. The first liver transplant in the state at Mahatma Gandhi Hospital gave a new lease of life to 25-year-old Suresh (name changed) who was suffering from liver cirrhosis. After 43 days of medication and monitoring by the doctors, first cadaver heart recipient of the state, 32-year old Surajbhann walked out hale and hearty from Mahatma Gandhi University of Medical Sciences and Hospital on Monday. Mahatma Gandhi Hospital has organised a Press conference and awareness programme on the eve of World organ day . Cadaver Transplant at MGH from a brain dead patient saved 2 lives. A Patient brought to MGH for treatment on 21st July was suffering from Brain hemorrhage was declared brain dead on 22nd July. after consent of his family his both the kidneys are harvested and transplanted to a woman who was suffering from kidney transplant from last 12 years and gave her a new life , the other kidney as per rule is sent to SMS hospital and transplanted to other woman. Liver transplant is going to be start at MGH , it will become the first hospital who will perform liver Transplant in the State. Doctors have performed one of the rarest neuro surgeries using the Navigation and Sonography Assisted Technique on Monday. This is the first time when Sonography technique has been used during a brain surgery. 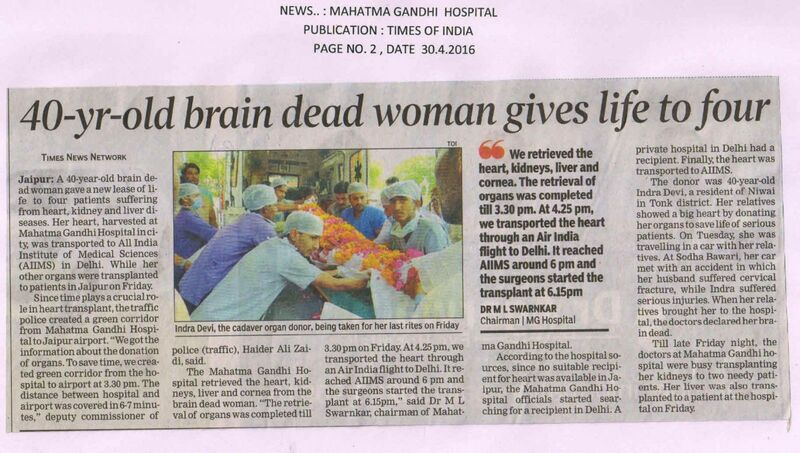 Mahatma Gandhi Hospital performed state's First Multi Organ Retieval in a brain dead 6 year old boy , beating heart patient. Donor's Kidney are transplanted to a 50 year man in MGH nad liver was sent to ISBL hospital. Inauguration of upgraded services of hospital- 60 beded I.C.U, Multiorgan Transplant Unit, 21 beded dialysis unit, 25 beded PICU and NICU by Mrs. Vasundhara Raje Ji ( Honorable Chief minister of Rajasthan ). 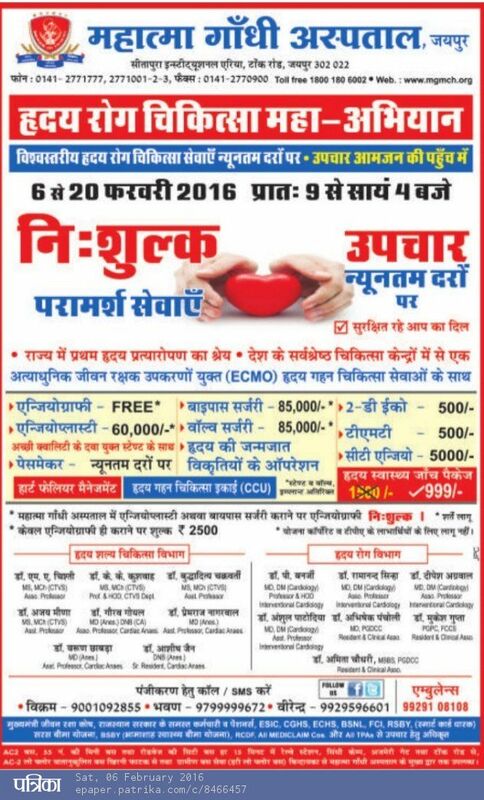 Mega Surgical camp at MGH from 25th Jan. to 1st Feb. Mother's milk can save the life of an infant. It is like giving blood to an accident victim who needs it immediately,"
Mahatma Gandhi Hospital has become the first private hospital in North India to have signed an MoU with Inaya Foundation, an NGO to set up a mother's milk bank in Jaipur. The concept of mother milk bank gained popularity in the state after one such bank became operational in Udaipur in April 2013. The mother's milk bank has provided thousands of units of milk to infants in need and whose biological mothers were unable to feed them immediately after their birth. Each unit contains 30 ml of mother's milk. MGH gifted a hand by replanting it to a 5 yr old female child..
On the occasion of new year our Mahatma Gandhi hospital gifted a hand by replanting it to a 5 yr old female child..
MG Center for Neurosciences welcomes Dr Pankaj Gupta MCh, Sr Professor Neurosurgery. The eminent Neurosciences team at MGH comprises of Dr Pankaj Gupta as HOD, Dr Rohin Bhatia MCh, Dr Jitendra Verma MCh and Dr Gaurav Goyal and Dr Amit Agarwal ( both DM Neurology). The new Neurosciences team will live up to the expectations of the society by providing high quality treatment services to everyone using the latest technology like minimal access brain and spine surgeries ( for the first time in the state ). 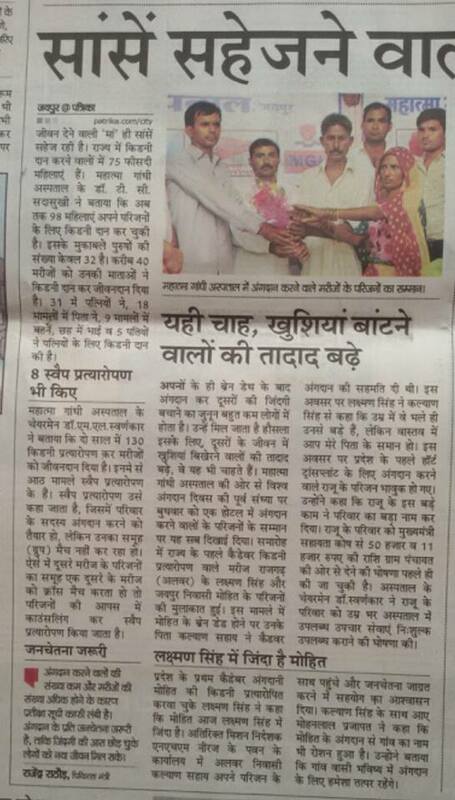 Medical and Health Minister Rajendra Rathore said the private hospitals will be allowed Kadebr transplant. Ross Medical University of Mahatma Gandhi on Sunday, Sitapur Goldsmith Auditorium Fijishin conference "Secrets Apikon" speaking as the chief guest at the closing ceremony were. 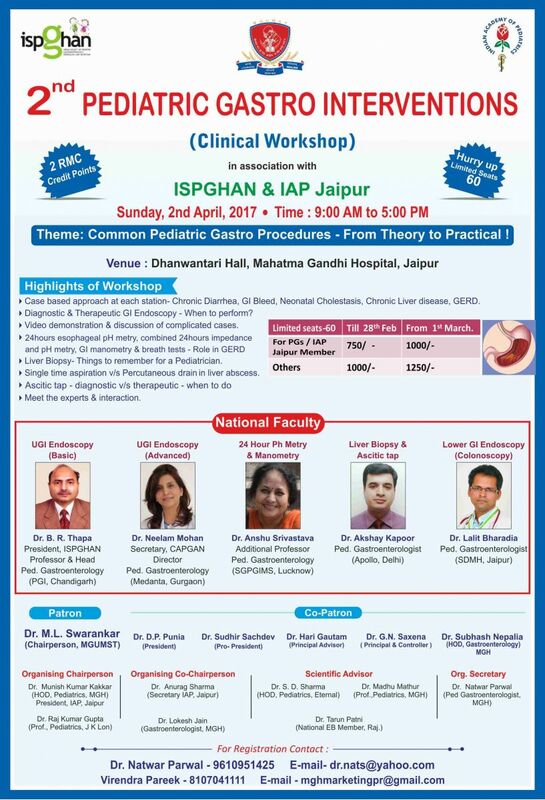 25 th Annual Conference of Association of Physicians of India- Rajasthan chapter. RAJ APICON 2014 is organizing at Mahtma Gandhi university of medical Science and Technology on 15&16 November. MGH is organizing Mega pediatric camp, providing free consultation, medicine and investigation services for IPD patients, 25% discount on special investigation and all pediatric surgery in Rs. 3000 only. 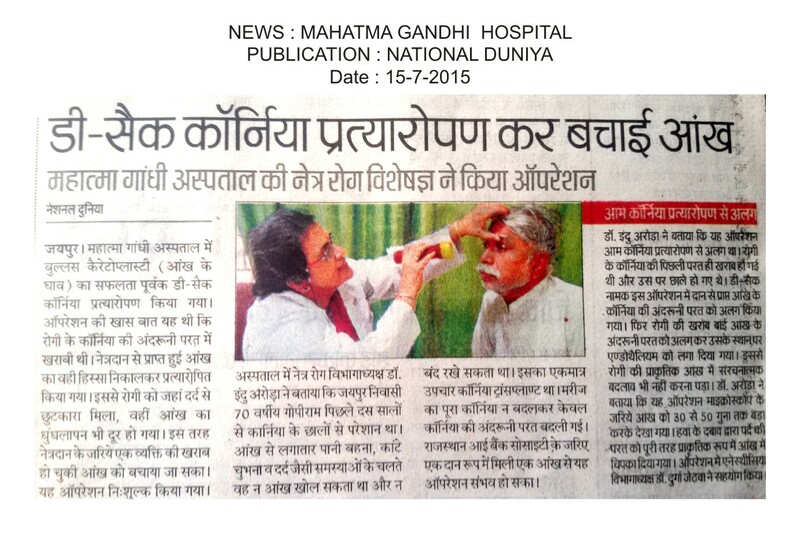 Peadiatric department of MGH introduce Super speciality facilities like Pead. Gastroenterology, Pead. Emergency, Pead. Nephrology etc. MGH Kidney Transplant team has performed another successful Swap Kidney Transplant Surgery. 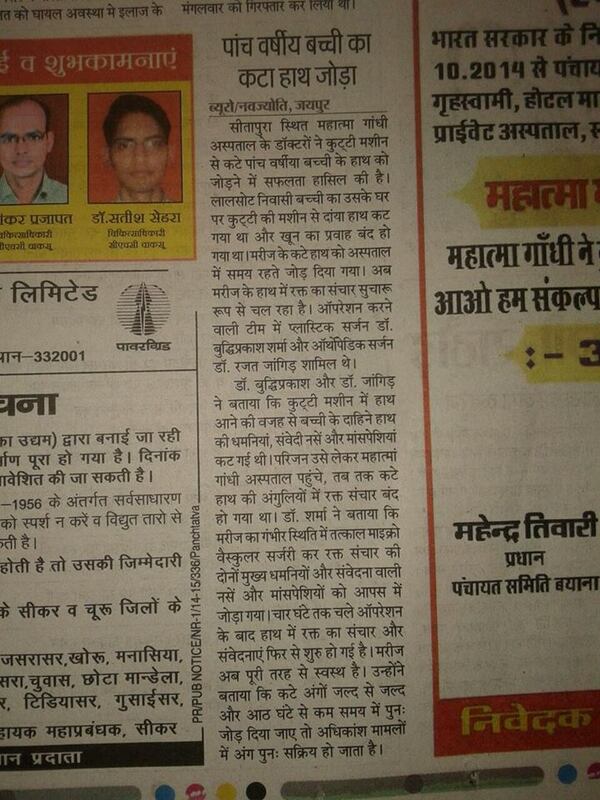 The Team is having a credit to perform highest Kidney Transplant numbers in State. This success rate is at par to world level.